For others, beautifully styled accommodation comes in the form of 5 star luxury cottages with high quality interiors appeal. 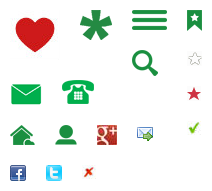 Whatever type of cottage best suits your tastes, we’re confident that you’ll find somewhere that fits within our extensive collection. When looking to take a self catering or country cottage holiday many of us long for a beautiful cottage with beautiful interiors and designer décor - a special place to stay, especially for a birthday celebration or anniversary to remember. Luckily there are lots of beautiful cottages throughout the UK. Enjoy browsing through the beautiful cottages below for inspiration. 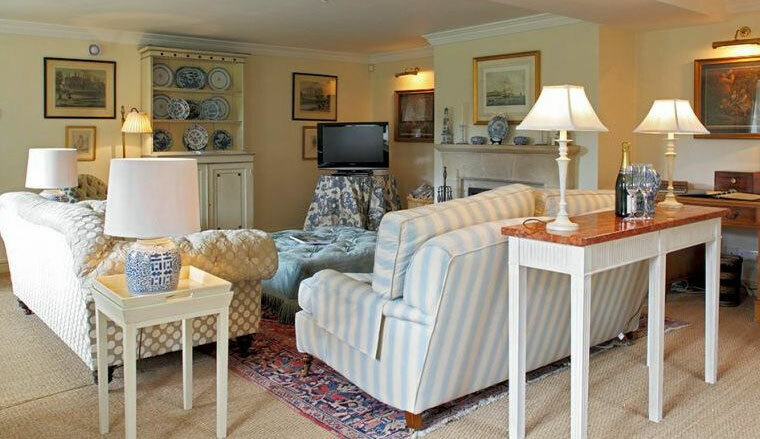 The beautiful cottages to rent listed below are our pick of some of the best that offer exceptional furnishings and interior design along with attention to detail that contributes to a luxurious stay. For a country cottage that is beautiful inside and out, take a look at Little Canwood House. This fabulous rural retreat has 4 bedrooms and is located in unspoilt Herefordshire. With features such as exposed wooden beams successfully blended with modern interiors, this holiday home is 5 star Tourist Board rated and accommodates up to 8. With features such as granite work tops in the kitchen, a wood burning stove in the lounge and doors that lead out to the garden, this is a very special place to stay. Gold award winning, Little Canwood House is as impressive outside as in. There is outdoor seating outside for enjoying on summer days and located on a farm, the house has wonderful country views. There are also stabling facilities available on request and an indoor riding school close by, ask the owners for more information. There is plenty of good riding country, bridle paths and country lanes conveniently close by. Set in a tranquil rural location, the city of Hereford is just 15 minutes away so easily accessible for day trips. Click on the photograph to view the beautiful interior. Book this architect designed holiday home that is set in beautiful countryside and offers a classically tasteful interior. 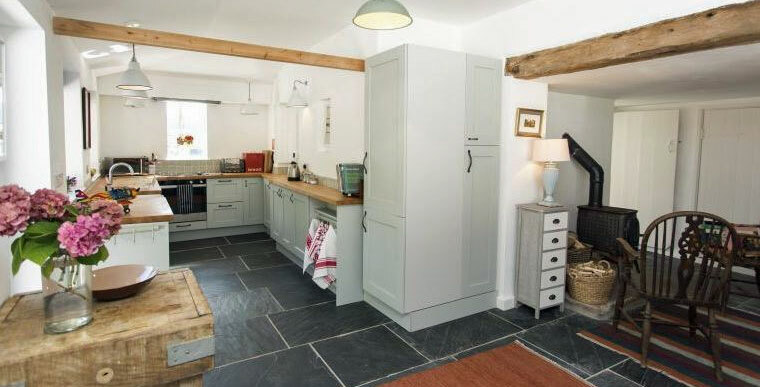 Natural light and pale colours make this cottage near Monmouth a most inviting place to stay. Laundry Cottage in Aldeburgh, Suffolk, is a beautifully restored Elizabethan cottage full of original character and quirky features. 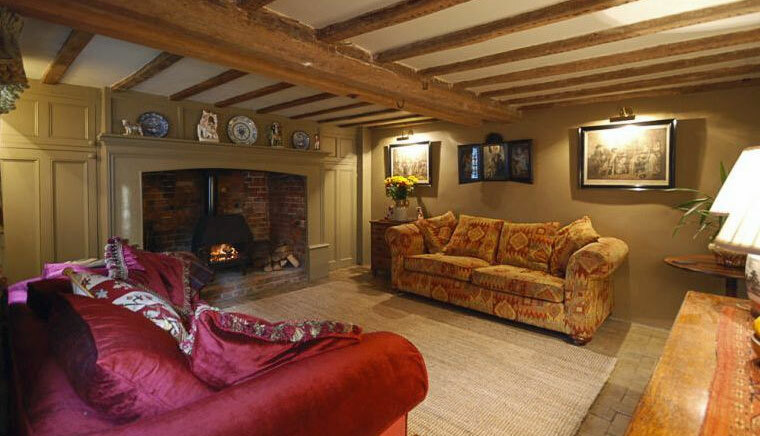 This luxury cottage is filled with original features, stunning textiles and the finest attention to detail. This property has a wonderful romantic four poster bedroom and has been beautifully decorated. It can sleeps up to five people. Suffolk is a superb county to visit for boating, antiques and stunning landscapes. Also from the Grove Cottages is Mint Cottage, a wonderful romantic cottage for two. Click on the image on the right for more details of this historical holiday home. This cottage benefits from a number of charming features including exposed wooden beams, oak floor boards and original brickwork. National Winners of VisitBritain's Excellence in England Gold and Silver Awards for Self-Catering Holiday of the year 1998 and 2003. 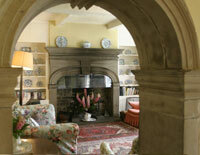 Bruern Cottages are the finest self-catering properties, not just in the Cotswolds but in the whole of Great Britain. The twelve cottages were converted from the Victorian stable yard and outbuildings of Bruern Abbey. They are stylish, luxurious and unusually well equipped, country houses in miniature, with open fires and four poster beds as well as state-of-the-art bathrooms and kitchens. They sleep two to ten. Each has a private enclosed terrace and many have their own secluded gardens. In the beautifully landscaped communal gardens and grounds there is tennis, croquet and swimming. Children have their own special play area with a two storey playhouse, a climbing frame and an indoor playroom. There are wonderful wildlife walks in the neighbouring Nature Reserve at Foxholes and along the Oxfordshire Way, which runs through Bruern. Please click on the cottage photograph for details and availability. For a stay in a warm and welcoming holiday cottage with beautiful exposed rafters along with a range of other charming features, the Old Forge could be the ideal place to stay. This very special holiday home features a spiral staircase along with a galleried mezzanine. Located in North West Herefordshire, this property sleeps up to 3 and was originally a blacksmith’s workshop but has had the magic of an architect’s touch and now offers high quality self-catering accommodation throughout. Gold award winning, with special touches like a super-king size bed in the master bedroom and a beautiful roll top bath in the bedroom, this holiday cottage is ideal for romantic breaks. French doors open out to a terrace where you will find the garden with lawn, edged with lavender and beech. Click on the photo for more information about this fabulous luxury cottage. With a stunning location in the heart of the Vale of Taunton Deane in Somerset, the West Country, the Long Barn sleeps up to 12. 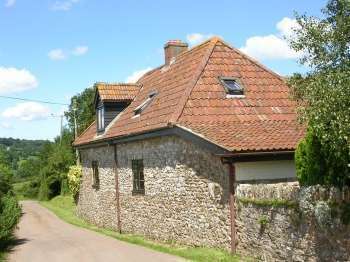 Marvel at the country views here where you can look out on both the Quantock Hills and the Blackdown Hills. You can settle into a slower pace of living, where only the Hillfarrance brook looks like it is in a hurry. The newly converted barn lies in the middle of a 450 acre estate, where the family indulges its passion for horses. Emerge into the Somerset air and you may believe that you have gone back in time to a more leisurely era. But go through the door and you will be reassured that the house has every 21st century convenience. 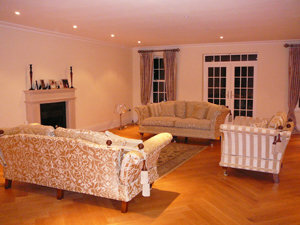 Gas central heating radiates warmth in winter, whilst in the main living area, a wood burner adds additional ambience. The Long Barn has the highest standards of furnishings, fixtures and fittings. There are 5 large bedrooms, all en-suite which can accommodate up to 12 people comfortably. All the bedrooms can have double beds or twin beds depending on your preference. The large kitchen is well equipped, but do not feel you have to use it: caterers can be supplied if required. Despite its rural location, the Long Barn is close to transport links. It is 15 minutes from Taunton railway station and the same from Junction 25 of the M5 motorway. If you want to do more than relax in the hot tub in the sunny garden, admiring the views, Somerset provides a wealth of possibilities. A heated indoor swimming pool is just one of the extra special features here. There are lovely country pubs, Exmoor is nearby, and the farm is situated on a national cycle route. The excellent Oake Manor Golf Club is a couple of miles away. Ideal for a holiday or a short break, the Long Barn is the perfect country retreat for you, your friends and your family. Click on one of photographs for more information and interior views of this beautiful barn conversion. 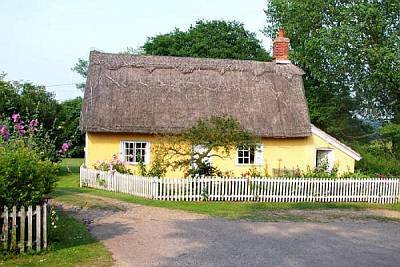 Cobbs Cottage is a lovely 17th Century thatched cottage in a tiny cluster of 4 cottages all on their own overlooking the beautiful Box River valley, the setting is magical and the area is one of the prettiest parts of Suffolk. This idyllic country cottage in the Box River Valley features a gorgeous thatched roof and is simply picture-perfect. Up to 5 can be accommodated in the 3 bedrooms and the property is pet-friendly. Reached via a single-track country lane, this is an ideal rural retreat yet is only 90 minutes by car from London. There are lots of good country walks nearby and you can even walk to the nearby pretty village of Polstead. 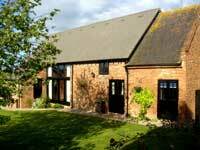 Click on one of the country cottage photographs for more information and availability. 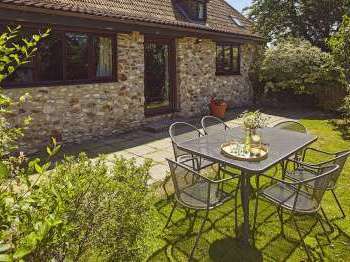 These luxury Cornish cottages come in a variety of sizes and sleep from two to eight people, at Treworgey and provide luxury self-catering holiday accommodation with heated swimming pool and horse riding holidays in an idyllic setting. There is a licensed riding school offering lessons and hacking through beautiful countryside around Treworgey. Friendly supervision and fun for all kids! 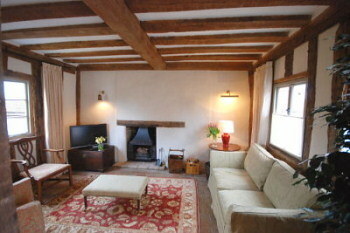 Each holiday cottage is individual and features a high quality interior. 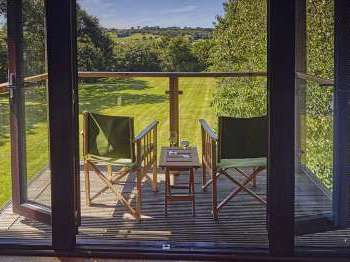 With views over the tranquil Looe river valley, this is a lovely place for a quiet cottage break in the countryside. Each holiday home has its own private garden and you can even look out towards the sea. In total there are 150 acres of gardens at Treworgey. Take a short drive and you can be by the seaside and discover the pretty coastal town of Looe. Spend fun family days on the beach or walk the South West Coastal Path, the choice is yours. Click on the photograph for more information and to take a peek at the beautiful interior of this cottage in Cornwall. This is a fantastic country house with a country setting as fine as its interior. Beautiful inside and out, Higher Lee has 4 bedrooms and sleeps up to 10. Said to be one of the finest holiday homes in the Trough of Bowland, this country house dates back to the 17th century, features beautiful interiors and benefits from a number of historical features. Unique and charming, the interior is stylish and comfortable. Featuring an elegant drawing room, a games room with table tennis and table football, a dining room, kitchen with Aga, four bedrooms and two bathrooms, this holiday home offers plenty of space. 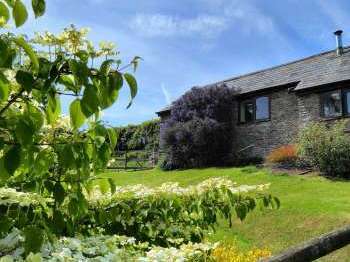 Located in 2 acres of gardens with lawns, an orchard and a stream, Higher Lee enjoys a magnificent countryside setting only 45 minutes drive from the Lake District National Park. Short breaks and longer stays are available. With beautiful interiors with wooden clad walls, take a look at Lazyday Cottages in the Scottish Borders. There are three luxurious log cabins at this tucked away countryside location close to Fishwick. Short breaks and longer stays are available. These holiday homes are 5 star rated by the Scottish Tourist Board. With the style of a boutique hotel, these log cabins have been designed to offer the highest levels of self-catering accommodation to guests. Cosy, warm and welcoming, these lodges are a great place to stay. Each of the lodges feature an open plan living area with seating, dining area and kitchen, two comfortable double bedrooms plus en-suite bathrooms. Outside you will find a patio with bbq, a front garden as well as lovely views of the surrounding countryside. There is a shared hot tub and Finnish suna which guests are free to use to relax and unwind. Why not give your loved one a romantic weekend log cabin break? 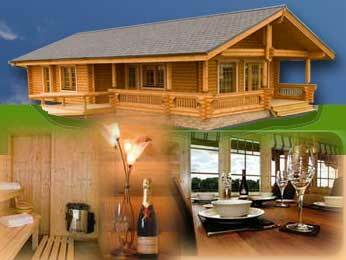 Click on the log cabin photograph to find out more about these luxurious log cabins with stylish interior decor or click here to find additional log cabin holidays. Set in a glorious country setting with wonderful views of the surrounding countryside, Higher Scholes Cottage is a special holiday home. Situated close to Haworth and the moors made famous in Wuthering Heights, this could be a great base for discovering the best of Bronte Country. 5 star rated, White Rose awarded and Gold Award winning, Higher Scholes offers the highest standards of self-catering accommodation. There are 2 bedrooms and the cottage sleeps up to 4. Charming features include the wood-burning stove in the lounge, a roll top bath in the bathroom and the outdoor hot tub where you can enjoy soaking up some relaxation as well as sublime country views. 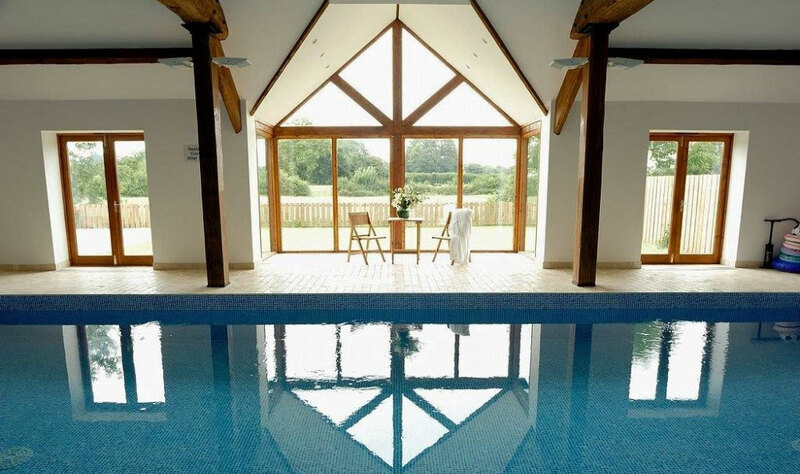 Rofield Barn offers high class 5 star rated self-catering near Cheltenham in the Cotswolds. Spacious, light and airy throughout, it has a beautiful interior living area with its high vaulted ceiling, exposed beams, traditional stove and superb views across the enclosed garden to the Cotswold countryside beyond. There are 4 bedrooms, 3 bathrooms and up to 8 can be accommodated. Features include flat screen TV with Freeview, WiFi broadband internet access and a DVD player. 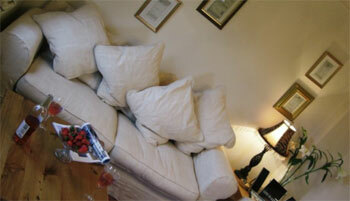 The owners have taken great care to ensure that this holiday home is well equipped for a relaxing holiday. The main living area looks out on the lovely garden and out towards the nearby Cotswold countryside. This is a great holiday barn conversion for a break at any time of year. Click on the photograph to explore details of this beautiful Costwold property and interior images.